LAMO: Lamo likes to go for walks or ‘walkies’. He loves wearing his collar and leash. The rest of his pack, Wallace, Judy and Poppy. Lamo loves to swim and play around with the ducks. Lamo is part of the family. JACK: Allison, in the video below, introduces six month old Jack. Jack’s friend is learning from Jessie to be a sheep dog. Jack likes to shake hands and loves to see people travel by on the canal. Aside from herding the sheep into the pen, he likes to go for walks and tries to beat Jessie in a game of fetch. Lamo and Jack are Sheep. Sheep are intelligent, sensitive, social and emotional animals. Some people think sheep are stupid due to their strong flocking instincts. It is not that they can’t think for themselves but rather they instinct to flock serves as protection from predators. Sheep can remember the faces of other sheep in their flock and human faces. They can recognize human facial expressions. In West Yorkshire flocks of sheep have developed the skill to cross cattle guards to reach the yummy food on the other side according to a BBC report by rolling on their backs. Sheep are quite intelligent creatures and have more brainpower than people are willing to give them credit for. National Sheep Association. As a PETA advocate I suggest you read The Hidden Lives of Sheep. Sheep are often treated cruelly by farmers, skin carved without painkillers and more. Remember our motto: Be The Change. You Can Make A Difference. And now more about Allison and Lamo. 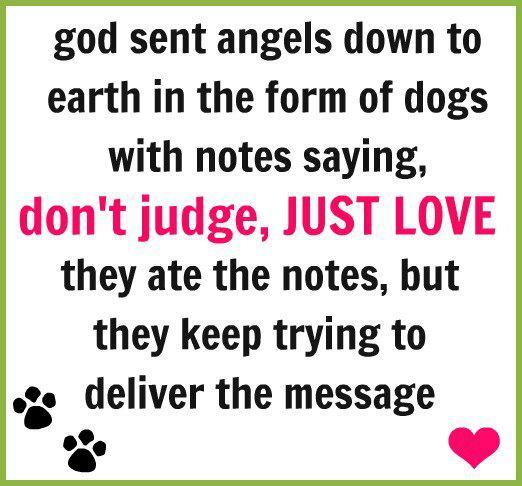 Dogs are Angels. Say a Prayer. Today say a prayer for all animals. Pray humans act humanely. Pray their Guardians love and care for them. Today I am thankful for all the dogs that have blessed me. I deeply miss and love the ones that are dead. I love and cherish the companions “the little boogers” that share my life with me now. P is right. She is one (1). And every 1 animal is precious. Every animal deserves & requires love and care. BE The CHANGE! You Can Make a Difference. Dogs and Our Animal Companions Are Better People Than Us. Books. Dogs & Our Animal Companions Are Better People Than Us. If you are a dog lover, you already know that dogs are better people than humans. Here are some wonderful books that help make the point. A Dog Walks Into a Nursing Home: Lessons in the Good Life from an Unlikely Teacher by Sue Halpern. Funny, moving, and profound, A Dog Walks into a Nursing Home is the story of how one faithful, charitable, loving, and sometimes prudent mutt—showing great hope, fortitude, and restraint along the way (the occasional begged or stolen treat notwithstanding)—taught a well-meaning woman the true nature and pleasures of the good life. The Possibility Dogs: What a Handful of “Unadoptables” Taught Me About Service, Hope, and Healing by Susannah Charleson. “Charleson journeys into the world of psychiatric service, where dogs aid humans with disabilities that may be unseen but are no less felt. This work had a profound effect on Charleson, perhaps because, for her, this journey began as a personal one: Charleson herself struggled with posttraumatic stress disorder for months after a particularly grisly search. Collaboration with her search dog partner made the surprising difference to her own healing. Inspired by that experience, Charleson learns to identify abandoned dogs with service potential, often plucking them from shelters at the last minute, and to train them for work beside hurting partners, to whom these second-chance dogs bring intelligence, comfort, and hope. Scent of the Missing: Love and Partnership with a Search-and-Rescue Dog by Susannah Charleson. Charleson first book. In the wake of the Oklahoma City bombing, Susannah Charleson clipped a photo from the newspaper of an exhausted canine handler, face buried in the fur of his search-and-rescue dog. A dog lover and pilot with search experience herself, Susannah was so moved by the image that she decided to volunteer with a local canine team and soon discovered firsthand the long hours, nonexistent pay, and often heart-wrenching results they face. The Silence of Dogs in Cars by Martin Usborne. “Photographer Martin Usborne is on a mission to save as many animals as he can in 365 days. His aptly titled project—A Year to Help—began in July 2012 and will wrap up next month. The quest has sparked him to travel the world visiting rescue shelters in Spain and a dog meat restaurant and a zoo in the Philippines, as well as to launch a blog chronicling his adventures. In his just-released photo collection, The Silence of Dogs in Cars (Kehrer Verlag), he aims to capture the way in which we silence, control or distance ourselves from other animals. Mission accomplished.” quote by Abbe Wright. The Dog Who Couldn’t Stop Loving: How Dogs Have Captured Our Hearts for Thousands of Years by Jeffrey Moussaieff Masson. What You Can Do Today to Help Animals. What on small thing can you do today and every day to help animals? It isn’t a trick question. I know I could list and list and list things you can do to make life better for animals. But today and every day one thing you can do is find a charity, foundation, website that focuses on animal rights and care. The Animal Rescue site routinely has a Shelter Challenge. Based on votes shelters and rescue groups can be granted money or supplies. You can ask to be sent reminder emails every day for both the shelter challenge and the click to give food. So easy and every click makes a difference.